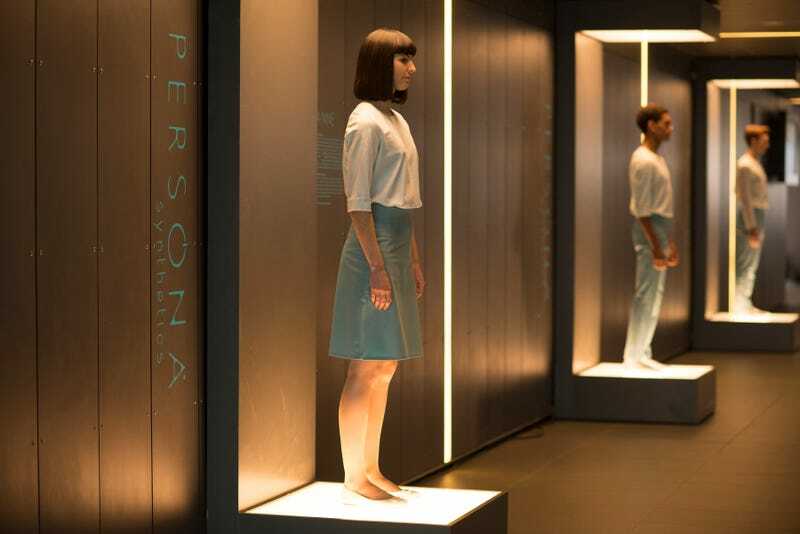 Humans has already premiered in the UK, but American viewers will finally get to see this android show on June 28 on AMC. We talked to writer-producers Sam Vincent and Jonathan Brackley and with stars Katherine Parkinson and Tom Goodman-Hill, and they told us human beings are this show’s real monsters. There’s the Hawkins family—mother Laura (Parkinson), father Joe (Goodman-Hill), 17-year-old Mattie (Lucy Carless), teenager Toby (Theo Stevenson), and eight-year-old Sophie (Pixie Davis)—who have just added a synth called Anita (Gemma Chan) into their house. There are synths who appear to have achieved full A.I., who are on the run from the mysterious Hobb (Danny Webb). And there is Dr. George Millican (William Hurt), who was once an engineer on the synth project, who now needs one in his home to take care of him. His outdated model, whom he has a powerful attachment to, is replaced by the personality-less—but domineering—Vera (Rebecca Front). “Because that’s what we like to think we would create,” said Goodman-Hill. “That’s sort of the human condition full stop. We cause the damage and then worry about it afterwards,” she said later. However, producers Sam Vincent and Jonathan Brackley are both adamant that everyone’s point of view in the show—either pro- or anti-synth—is presented neutrally. “We’ve tried very hard to be authorially neutral in terms of where we want your sympathies to lie. We’re trying to be subtler. Naturally, with some of the stories like Niksa [a synth in a brothel], you’re going to be sympathetic with because she’s in such an awful situation, and you’re rooting for her to get out of there,” said Vincent. “But within the whole of things, we want to play to hopefully leave space for the audience to say ‘I’m with Anita’ and other to say ‘I’m with Laura, I wouldn’t want that thing in my house. With my family.’ We wanted to sort of give arguments and not be sort of didactic about who you were supposed to be rooting for,” he continued. If the writers tried to be so neutral, why do they think the first few episodes feel so sympathetic to to synths over the humans? “That said, there are some great reveals in the original which we took hook, line, and sinker,” added Vincent. “Oh yes, we stole all the good bits,” agreed Blackley. In Humans, the five members of the Hawkins family each have very different opinions on having a synth in the home—all of which reveal something unpleasant about the human characters. Except for Sophie, of course. The eight-year-old is the only one to instantly bond with the new synth, pairing the robot with the small child for maximum sympathy. For Joe, his almost unthinking acquisition of what looks like another human being doesn’t reflect too well on him. “He doesn’t actively think about it, he just has a sort of knee-jerk response to feeling harried and stressed—‘I’ll go get a robot to do it for me.’ It’s a very ‘boys and toys’ attitude that he has to it,” said Goodman-Hill. Meanwhile, Joe’s wife, who has been away a lot recently, projects a lot of her uncertainty about parenthood onto Anita. She may have started off with good reasons, but she becomes more irrational and emotional about having a robot in the house. Mattie is very negative about the synths, thinking that there’ll be no future for her when synths will take all the jobs. “The eldest daughter Mattie, she’s seventeen and she’s about to venture on into further education and decide what she’s going to do with her life. But she’s at that stage where she thinks that these things are making her future career redundant,” said Brackley. Meanwhile, Mattie’s brother Toby is “a typical teenage boy, lusting after the synth, and Sophie [the youngest] has always had these things around. She grew up with them, like my daughter will grow up with iPads,” explained Brackley. Vincent did say that there is some hope for these people: “Their viewpoints will change and their attitudes will adjust. For example, Toby’s teenage hormonal lusting deepens into something more touching. Everyone’s viewpoints shifts and changes as they actually learn.” Only after watching the whole show can you actually decide whether you stay essentially sympathetic to the enslaved synths—or if you come to agree with the humans who fight against this scary new technology. Or a little of both.